For many, Parks and Recreation seems like nothing more than a weird clone of The Office, and I can understand why people feel this way. One, it was created by Greg Daniels and Michael Schur, who both have strong ties to The Office. And truth be known, the show was originally conceived as some sort of a spin-off to the series using the same mockumentary style. But despite its awkward first season, the show eventually evolved to have a voice of its own - and this is the season where that really happened. This second season makes the first season feel like little more than dress rehearsals for what they managed to accomplish here. And as someone who watched the first season, I have to admit I wasn't expecting all that much going in. I had only started watching the show because of the praise it had received from many different critics and that kind of a buzz had to be coming from somewhere, right? But whatever it was, I just didn't see it as far as the first season was concerned. This one really turned things around. 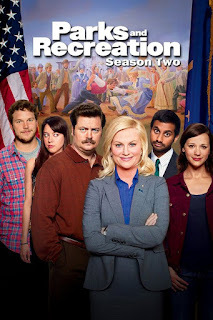 Parks and Recreation is an NBC comedy series that utilizes the same single camera, mockumentary style as The Office. This was also the season that got Amy Poehler nominated for an Emmy together with Gaby Moreno, who composed the title theme song. This season included a lot of major developments for most if not all of the characters on the show and really did a good job of fleshing them out, making them feel more real and of course start building realistic relationships, which is what makes such sitcoms thrive. Ann (Rashida Jones) broke things off with Andy Chris Pratt) after all the silliness of the first season. We finally meet one of Ron's (Nick Offerman) ex-wives - the evil librarian Tammy (Meghan Mullally). Tom's (Aziz Ansari) amazingly gorgeous wife Wendy (Jama Williamson) only married him for a green card. And Leslie (Amy Poehler) remains to be Leslie - the one woman who really seems to be running this department. Given the new places at the table, the writers clearly wanted to experiment with a few things. first they had Ann start dating city planner Mark (Paul Schneider). Then Andy manages to get a job at the department shining shoes and starts to attract the attentions of the ever-cynical April (Aubrey Plaza). And then they capped everything off with trying to make the show more relevant to the times by bringing the government to the brink of a possible shutdown due to budget issues. How appropriate, right? Whether it was intentional or not, it always felt like the writers were really putting their money on the Ann-Mark relationship as somehow becoming this show's version of Pam and Jim's relationship on The Office. They gave him a chance to woo her and try to win her over but in the end it just felt weird. Maybe it was because the actor himself was reportedly not too into the role or maybe things were just badly written. Thus it became a heck of a lot more fun to follow the unintentionally charming dynamic between April and Andy. They're not exactly a match made in Heaven or anything like that, but it's such a weird paring that you can't help but look away. There's a point in the season when you start to realize that what may have started out as a silly joke to play out for a few episodes suddenly became a serious investment of character time with the potential to become something bigger. A big help to this season was bringing down Amy Poehler a few notches and not trying to make Leslie Knope as this show's version of the kooky Michael Scott. And having Nick Offerman as Ron Swanson act as a foil really helped things along since it's fascinating to see how the two actually work well together. As much as Ron seems determined to bring the government down from within somehow, he clearly respects Leslie and thus steps in from time to time to make sure she gets the supports she needs during those rather dire situations. The show is definitely funny and yet still somehow grounded in reality despite the occasional bits of insanity here and there. It just goes to show that real people can act a lot crazier than we're comfortable with accepting, especially in any forced social situation like working in an office together. 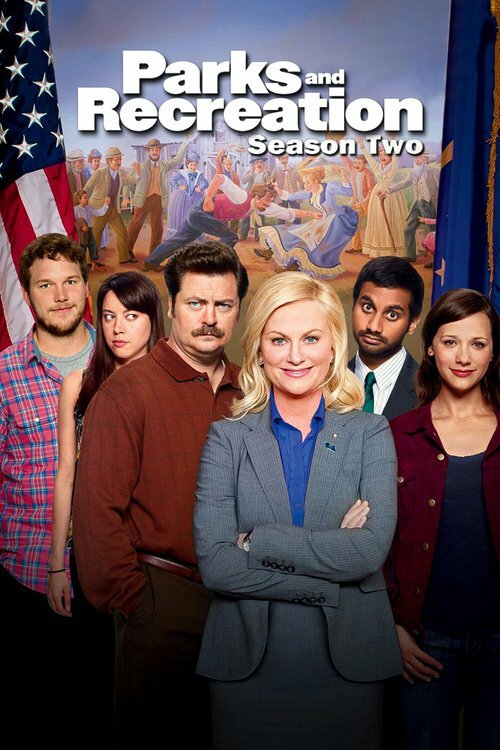 Parks and Recreation: Season 2 pretty much saved the show and turned things around. Instead of being just another ripoff of The Office, this time around it became a solid television sitcom of its own with a distinct voice and excellent use of celebrity cameos. It gets 4 insane ways that Ron and his ex-wife Tammy interact out of a possible 5.